We have compiled a Windows binary for the new ccMiner Lyra2RE fork by djm34 (source) that offers improved performance for the Lyra2RE algorithm for GPU mining on Nvidia-based video cards. Our Windows binary is compiled with VS2013 and CUDA 6.5 and supports Compute 3.5, 5.0 and 5.2 GPUs, so you can download and try it from the link below if you have compatible hardware. We are seeing a significant improvement from the previous hashrates that were available in ccMiner. 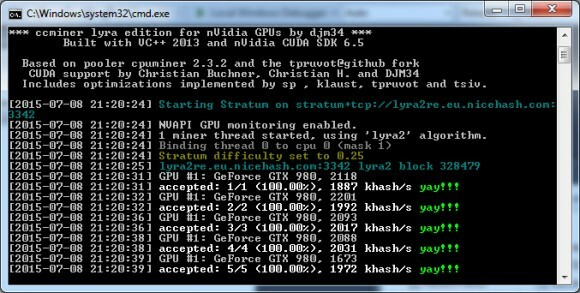 For example a non-overclocked GeForce GTX 980 has jumped from around 1325 KHS to about 2126 KHS with this new release, while with a GTX 750 Ti you can get a hashrate slightly lower compared to what was previously available on the GTX 980. A GeForce GTX 980 Ti card has jumped from about 2024 KHS to 2747 KHS, again non-overclocked results as with some OC and higher intensity you can get some extra performance.